Do you remember camp outs? What about an overnight at Half Moon Bay? The Dhahran Girl Scouts invite Girl Scout alumnae and leaders from across the Eastern Province to share their memories and photographs as part of the Girl Scouts of Dhahran 70th Anniversary Celebration being held this February 18th, 2017 in Dhahran. Even the smallest recollection will help weave the 70 year old history of Girl Scouts in Saudi Arabia. Here is a look at some of the memories alumnae have shared. 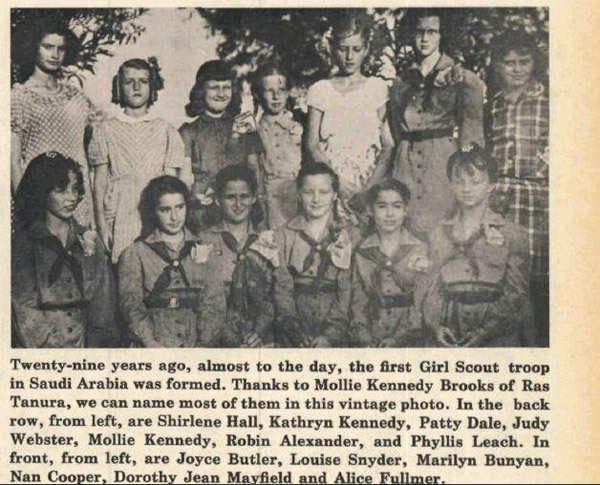 Judy Webster Bauer I was a member of the first Girl Scout troop in Dhahran formed in 1947. Miriam Biggins was our leader. I was a Brownie and Girl Scout from 1947-1952. My sister is Sue Webster Slavin and she was involved from 1950-1955. (Our sashes) are currently on display in the Heritage Gallery in Dhahran. (I remember) cooking dinner on Jebel Dhahran, I can still almost taste the stew I cooked, and fun trips and adventures (such as) overnight at Half Moon Bay - we slept in large screened tents on platforms; my sister remembers there were armed guards protecting them when her troop stayed overnight a few years later. Cornell Seymour My family lived in Abqaiq from 1980 to 2012. During that time both my daughters, Oni and Ayo Seymour were involved with the Brownies and Girl Scouts in Abqaiq. I was able to participate in the large annual camp outs that use to occur at the beach for all of the Aramco troops. I did this from about 1985 to 1990. Because of the first Gulf War, the camp outs were cancelled. They resumed later in about 1995. I participated for about two or three more times after that. These camp outs were lots of fun for the girls and the leaders as well. They were well coordinated and included lots of pranks. The girls really had a great time bonding with other Scouts form the other camps. Gladys McWood I joined Troup #1 in Dhahran I believe in 1953 or 4. I had to wait to be old enough, and I turned 10 in 1952. My mother, Marian McWood, was one of our scout leaders, and we had some meetings at our house: 925 9th Street. One afternoon we were working on a project outdoors at our house, and a dark cloud appeared on the horizon. As we watched, it became darker and darker, and nearer. The “cloud” was locusts! In the next couple of days, those insects devoured every bit of greenery on every bush, tree or lawn. They would get in your hair and cling to your clothes. (I also remember) overnight camp outs at the beach, where we built fires using wooden shipping crates for wood. Having no latrines, we walked to the back of the dune to dig a hole. I still have my sash with all the badges I earned. If you have memories and photographs that you would like to share, please send them by email to Kashmira Baldauf, Dhahran Girl Scouts Board Member at [email protected]. Whether you were a Girl Scout or a Girl Scout Leader during your time in Saudi Arabia, we would love to hear from YOU!! Seventy years ago the Girl Scouts started in Dhahran and we are part of a 2.7 million global organization that believes in the power of every girl. Today, as over the years, our mission continues to be to help girls discover their strengths, passions, and talents. So we would like to hear from former Girl Scouts and Leaders about their recollections of being part of the Girl Scout adventure while living in Saudi Arabia. We plan on sharing these memories with our current girls on the day of our anniversary celebration. What are some of your favorite memories of being a Girl Scout? What types of activities did you do? Any fun trips and adventures you remember? What years were you part of Girl Scouts?